Officials in St. Louis County, Missouri, have extended a state of emergency that covers the city of Ferguson for at least another 24 hours, following protests earlier this week to mark the one-year anniversary of the shooting death of a black teenager by a white police officer. Authorities first indicated that a quiet Tuesday night could lead them to lift the state of emergency that has been in place since Monday. It was a result, authorities said, "of the criminal unrest" in and around Ferguson,” following the shooting of another young black man who police said drew a gun on the fringes of a Sunday night protest remembering Michael Brown, the teenager killed last August. But by mid-Wednesday, following a night of peaceful demonstrations, County Executive Steve Stenger said that while he was "pleased to report our law enforcement officers have established order while preventing further acts of violence in Ferguson," the emergency order will remain in effect for at least another 24 hours into Thursday. The countywide state of emergency increases the powers of government officials during times of declared crisis, including the ability to direct local police and security efforts. An executive order from the Missouri governor last year declaring a state of emergency during protests following Michael Brown's death prompted militarized police forces and federal security teams to establish a heavy presence on the streets of Ferguson. Amid the lower-level county declaration this week, tensions between protesters and police eased late Tuesday in the city. On Ferguson's West Florissant Road — the scene of previous clashes between security forces and protesters — scores of young people gathered around cars and sat along curbs in small groups across a shopping strip parking lot as evening fell on the city. Across the street, police wearing bullet proof vests chatted among themselves in clusters. A few times, chants broke out or a protester strayed into the street, but as night fell across the busy thoroughfare, there was little resemblance to the tension of previous rallies. It was a stark contrast to Monday night, when police arrested about two dozen protesters in the St. Louis suburb after demonstrators pelted them with rocks and bottles. 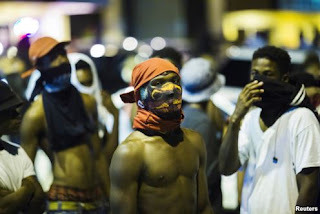 The tumultuous scene on Ferguson's streets, with mostly black protesters clashing with police equipped in riot gear, was further complicated by the appearance of a new group, white militiamen calling themselves Oath Keepers and wearing bulletproof vests and carrying rifles and pistols. The anti-government activist group said it was in Ferguson to protect businesses from rioters and looters, but St. Louis County Police Chief Jon Belmar said their presence was "both unnecessary and inflammatory." The demonstrations that followed Brown's killing in August 2014 threw the St. Louis suburb into the national spotlight and sparked calls for better treatment of minorities by police. Sunday night in Ferguson, officers shot and seriously wounded an 18-year old suspect they say opened fire on them, leading to charges against the suspect and a state of emergency declared in St. Louis County to stem further violence. Police on Tuesday released surveillance video that they say shows the suspect, Tyrone Harris Jr., appearing to pull a weapon from his waistband moments before he was shot by police. Harris remains in critical condition.